In my last fleet update I said I was going to buy a Golf GTi Mk5. In typical car enthusiast style I've changed my mind yet again. You may recall I said I needed to sell my Audi TT and buy something with four seats and that, through a process of elimination, it was going to be a Mk5 Golf GTi. In the same article, going through the various options, I said, "Not an SUV - I don't want one if it isn't a Range Rover or Volvo and I can't afford either." For some of us the choice of car we run reflects the essence of our soul. We may not think we care what the neighbours think of what's sitting in the drive...but we do. And not just the neighbours. We care about what everyone thinks about our choice of car. When we're sitting in miles of traffic on a congested motorway we care what every other driver thinks about the car we're sitting in. We want our wheels to be an extension of our personality, to show to the world that we carefully thought about it and selected a machine that not only provided for our needs but that differentiated us from every other person who has ever bought a car. 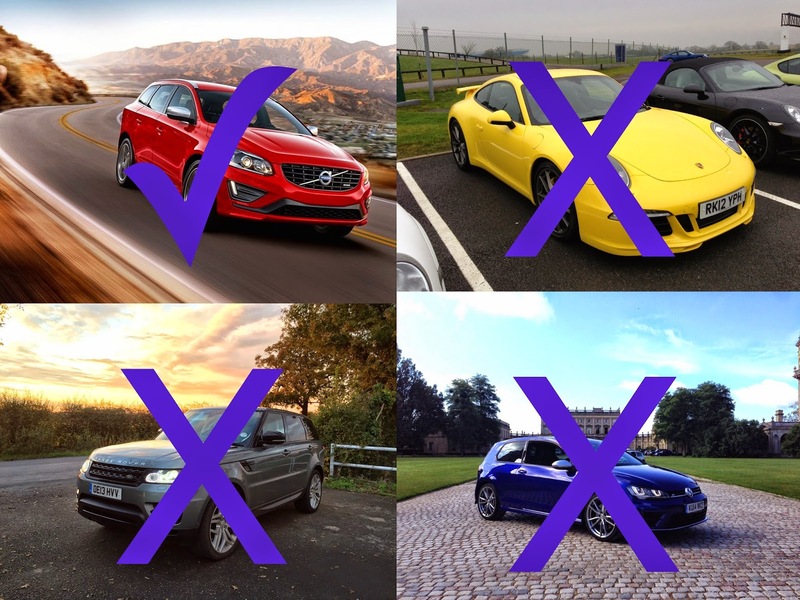 To a petrolhead choosing a car is a very important decision. Which is why we can never make our bloody minds up. Whenever I've driven a press car I've asked myself if I would want to buy that car for myself, my family, my circumstances. With most the answer is no. This is generally because it is too underpowered, too small, too impractical, not refined enough, because I could not afford it or for some small reason that renders a generally good car unfit for my personality and needs. For example using purely forensic analysis the Toyota RAV4 is an amazingly capably car that I would never buy. Not because it's a Toyota (I'd buy a GT86 if it had decent rear seats and a hatchback boot) but because the interior isn't up to snuff. It's functional but has no flair. Similarly the Maserati Ghibli fails on two counts - that of not being special enough for a Maserati and being outside my budget. If I were choosing a car based purely on my personality I would buy a Lotus Evora or a Porsche 911. But neither has four seats, both are too expensive for me and neither would be suitable for ferrying the dog around. Talking of the dog, she comes most places with me. Some cars are dog friendly and some are not. Mine has to be. I chose a Golf GTi Mk5 because I couldn't afford a new car. But, like any addict, I kept returning again and again to my obsession - the new car pages. I read my own reviews, I read the back pages of Autocar, I checked the financing on various cars. Technically I could afford to lease a car but wasn't confident financially that I could make the payments over the two or three year contract. I've just never been comfortable signing up to something that commits me to be paying out dozens of months hence. But then I realised something. The TT was paid for by a loan and until recently I was making monthly finance payments on my Triumph Street Triple. The bike is now 100% mine and if I sell the TT I can pay back the remainder of the loan. Therefore, at minimum, I can afford the combined sum of the two, which is £370. So, with renewed vigour, I spent hours searching leasing websites for a car with a low initial payment and monthly payments below £370. The obvious choice was a Golf R. It was at number one in my top cars of 2014 and there are some seriously cheap deals available, but such is its popularity that if I placed an order in December 2014 it wouldn't even leave the VW factory in Wolfsburg until August 2015. I'm too impatient to wait that long. Outside of a Golf my favourite car (that fits my needs) of the past couple of years is the Range Rover Sport, but monthly payments of that are in the area of £800. An Evoque would be a substitute of sorts and is more affordable but for some reason lease payments are quite high. Plus, if you want a Range Rover then you buy a Range Rover, not an Evoque. Then my mind flashed back to the Volvo XC60 I'd driven to Paris in the summer. Volvos have the best interiors in the business and the XC60 is practical, comfortable, has an incredibly smooth ride and is more refined than most German cars. At the time I thought if I could afford one I would buy one for myself. Remember what I said above? The only SUV I'd buy is a Range Rover or a Volvo. The XC90 is getting old and the new one is too expensive for me but I was wowed by the XC60. Volvos used to be square and safe, then Ford bought the company and ruined it. Since shaking off Ford's shackles Volvo has emerged as a left field contender to the German big three. Having driven most of its product I've been consistently impressed by them. I checked the lease pages. A few companies were offering staggeringly cheap deals, around 30% off. I found a deal from Stoneacre Motors for an XC60 D4 R-Design and emailed an inquiry. A couple of days later and I'd placed an order for the car, in Power Blue with the optional winter pack, rear parking sensors and rain sensitive wipers. It's in my budget and will be delivered in early March. Aside from a couple of company cars which I didn't choose this will be my first ever new car. I can't wait. Oh, and as the XC60 isn't exactly a driver's car I'm already thinking that I should keep my oar in with a cheap MX5 Mk2. But first I've got to sell the TT.